Search results for "met rooftop"
Uber’s flying taxi service is one step closer to getting off the ground after the ride-sharing company unveiled its latest flying car concept at their second annual Elevate conference in Los Angeles. The final design isn’t set in stone, but this new prototype is a template for the company’s five manufacturing partners to build off of. Elevate, also the name of Uber’s flying taxi business, wants to let passengers hail a flying car via app and hop from one rooftop sky port to another. 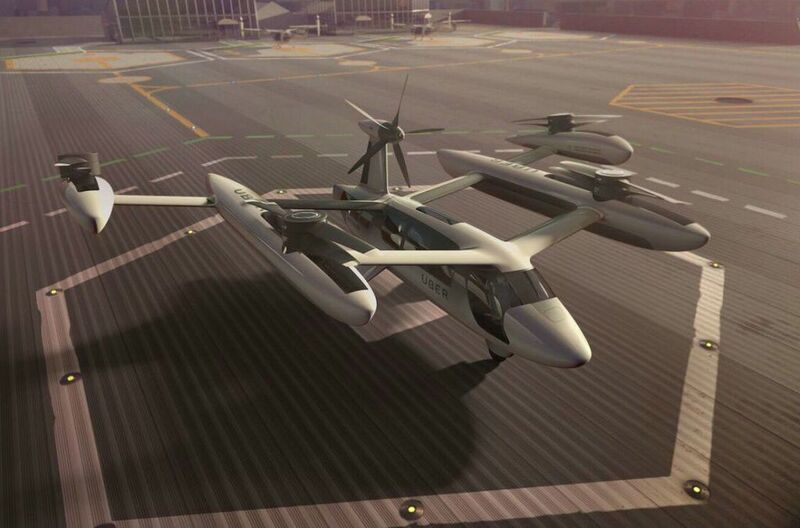 Designing a quiet, electric urban helicopter is no small technical feat, and Uber’s latest proposal shows something of a cross between a jet, drone, and helicopter that’s capable of vertical takeoffs and landings (eVTOL). The shuttles will seat four, though they’ll have to be autonomously driven for Uber to make a profit; otherwise two of the seats would go towards a pilot and co-pilot. To make the trips affordable, Elevate will introduce a model similar to Uber Pool, where customers can share a ride that’s going in the same direction and split the cost. Elevate expects its flying cars to hover around 1,000 to 2,000 feet off the ground and travel at 150- to 200-miles-per-hour, and has thrown out several reference models for its aerospace partners, Karem, Embraer, Pipistrel, Aurora Flight, and Bell as platforms to build off of. The latest model, first shown yesterday, would use four sets of stacked rotors for vertical lift and a tail-mounted rotor for thrust. Karem, the latest company to join Elevate, wants to build a working prototype of its eVTOL by 2020 and put them into commercial use by 2023. It might seem ambitious, but it’s a target that Elevate’s other partners are also aiming for. The infrastructure hurdle is another significant challenge that Uber will have to overcome if it really wants to make this system a reality. Besides having to actually develop software for the autonomously flying shuttles (something Uber has struggled with on the ground), the sky ports themselves and an unmanned air traffic control system will need to be built out. Elevate will be getting a bit of a boost in that department, as the company recently teamed up with NASA and the US Army to bring its ridesharing dreams to the sky. As Los Angeles gears up to tackle its homelessness crisis, L.A.-based Lorcan O’ Herlihy Architects (LOHA) is busy at work on a collection of novel, forthcoming affordable housing projects that aim to build upon the firm’s many previous experiments in dense urban housing. A recently-unveiled plan for the Isla de Los Angeles project with non-profit housing developer Clifford Beers Housing is perhaps the most daring of the new projects. The development will bring 54 studio apartments to a paved triangular site in the city’s Harbor Gateway community in a stepped and articulated structure made up of stacked and repurposed shipping containers. The rapid-rehousing development is being designed to house a series of shared spaces as well as parking along the ground level. The five-story project will be located beside the intersection of the 110 and 105 freeways and its site organization reflects this troublesome locale—the edges of the site will be populated by planted areas to block out freeway pollution while the building itself is laid out to face away from the highways in order to take advantage of the natural sunlight and breezes. Much of the complex is topped by shade panels as well. Amenity spaces for the project will include: edible gardens, space for a farmer’s market, a small lab, and areas dedicated to cottage-scaled food production, health and fitness activities, and job training services. Units in the 18,000-square-foot structure will be earmarked for residents who make less than or equal to 40 percent of the Area Median Income (AMI). 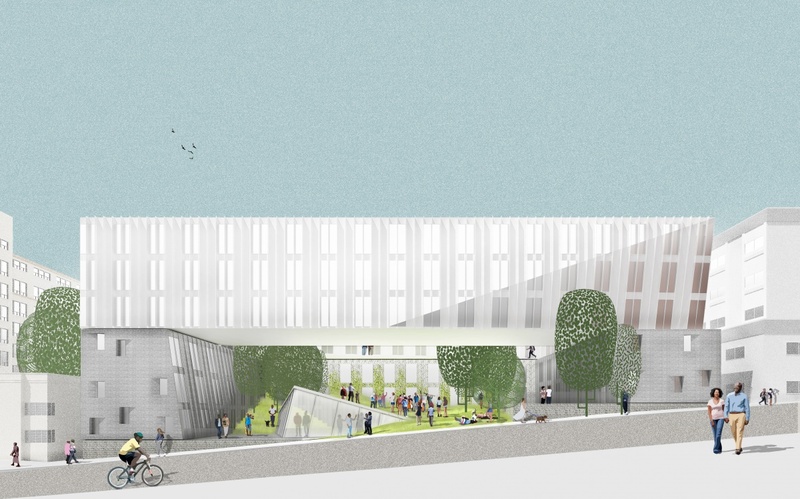 The project is to be built on excess city-owned land using funding from Proposition HHH, a recent initiative aimed at building 10,000 supportive housing units in Los Angeles over the next decade. The firm is also pushing forward on a proposal announced late last year that would add 78 units of affordable housing, various community spaces, as well as arts and educational programming to a city-owned site located in the Westlake neighborhood west of Downtown Los Angeles. The project will sit adjacent to the historic Westlake Theatre and is expected to reinvigorate the institution while ensuring its revival is suited to benefit existing neighborhood residents. Renderings for the seven-story project depict three linear and interconnected apartment blocks spanning over a central courtyard. The canted apartment slabs sit on a perimeter base that is open on one side to face the street and heroically span the courtyard above these otherwise porous ground floor areas in a way similiar to an approach pursued by Michael Maltzan Architecture’s One Santa Fe complex. Cesar Chavez Foundation is the lead developer for the project, with Meta Housing Corporation as a co-developer. The Youth Policy Institute will act as a service provider for the project in partnership with the United States Department of Housing and Urban Development. A timeline has not been released for either of these developments. LOHA is further along, however, on the MLK1101 supportive housing complex, a 26-unit development geared toward military veterans who have formerly experienced homelessness that is currently under construction. 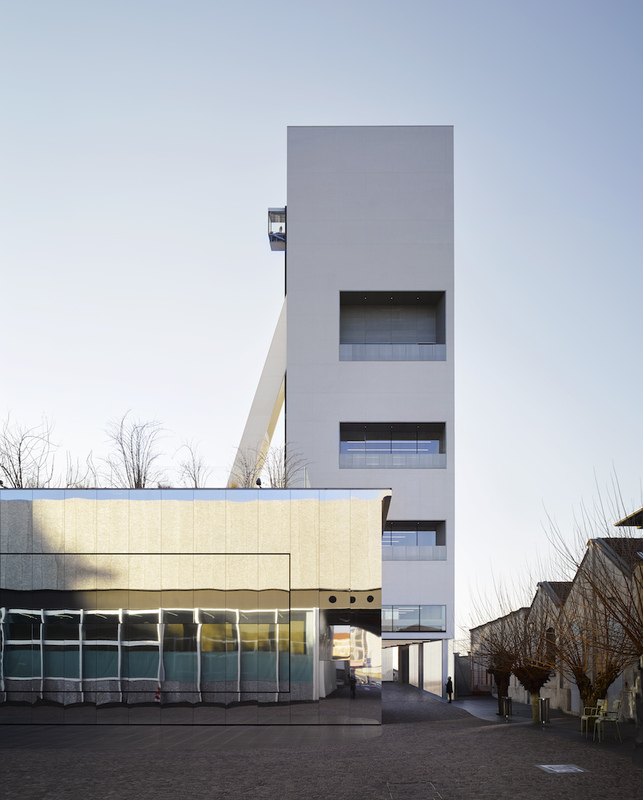 The four-story L-shaped apartment complex wraps a single-story storefront space that is topped with a rooftop terrace and community room. The storefront is being developed as a retail opportunity for the project and is flanked by a broad stair that leads to the terrace level, where picnic tables, plants, and benches will populate the 4,000-square-foot gathering space. Renderings for the 34,000-square-foot project depict a white perforated metal panel-clad structure with a pedimented retail space wrapped with storefront windows. Work on the project is well underway and is expected to be complete later this year. These developments join LOHA’s growing slate of innovative residential projects in Los Angeles, including several market-rate developments along Pico Boulevard, a 30-unit apartment complex in West Hollywood, and a quintuplet of small-lot houses at the foot of the Hollywood Hills. Sometimes you just have to go for broke and hope for the best. At least, that seems to be the route the developers behind a massive Rafael Viñoly Architects-designed project slated for the dying Vallco mall in Cupertino, California have in mind, as they push forward with a new, denser version of their long-stalled Vallco Town Center project. Developer Sand Hill Property Company unveiled a new vision for the 55-acre site yesterday that invokes the recently-passed SB-35 state law, a measure that allows developers to override local opposition and certain environmental controls for projects that meet local zoning code and set aside a specified percentage of their proposed housing units as affordable homes. 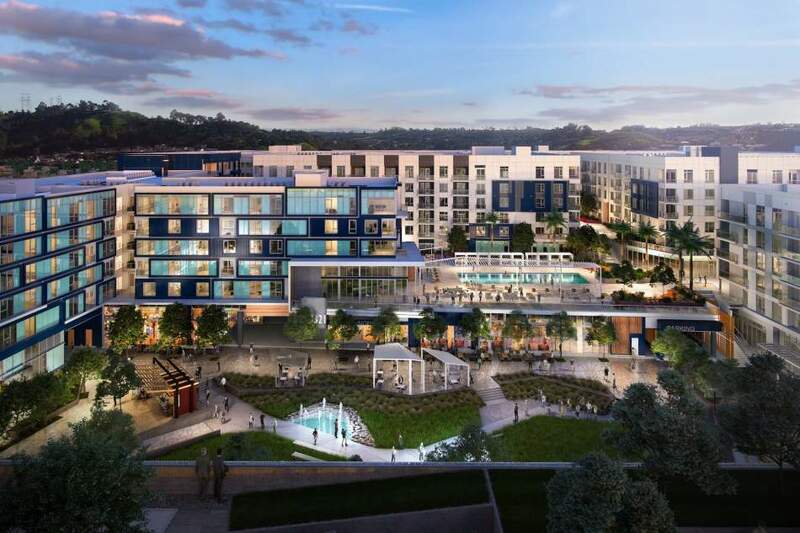 In the case of Vallco Town Center, Sand Hill Property Company is proposing a total of 2,402 units, with 1,201 of those set aside for extremely low- and low-income residents. The eye-catching project proposes replacing the city’s cratered mall with a sprawling mixed-use town square-style district containing 400,000 square feet of retail and entertainment functions, 1.81 million square feet of offices, as well as the aforementioned housing element. The entire thing, according to new renderings unveiled in tandem with the SB-35 plan, will be capped by a parabolic, publicly-accessible rooftop garden. According to a project website, the community park will feature walking and jogging trails, playing fields, picnic areas, orchards and organic gardens, children’s play zones as well as a “refuge for native species of plants and birds.” A series of public squares will also populate the retail areas, while super-sized entry portals will demarcate the development from adjacent, single-family home areas. Regarding the decision to take the SB-35 path, Reed Moulds, managing director of Sand Hill, told The Mercury News, “It has now gotten to a point where we do not have any confidence that this process can come to a conclusion in a timely manner,” adding, “This housing crisis needs to be resolved in a manner that actually provides near-term solutions, and sites like this have an opportunity to do a lot of good for the housing situation.” Under the latest plan, the Vallco development would help Cupertino surpass a state-mandated affordable housing production goal set of building 1,064 affordable units by 2022, The San Francisco Chronicle reports. The city has so far approved just over 800 affordable units via other projects. The developers have been working with community stakeholders and municipal authorities since 2015 on various versions of a proposed redevelopment plan, with the most recent reboot prior to the latest effort occurring in late-2016. Although the developers are pushing for aggressive expansion and a faster timeline with their latest version of the project, Sand Hill “does not intend for its SB-35 application to upset the ongoing planning process,” according to the project website. Under the new SB-35 regulations, local authorities have between 90 and 180 days to approve compliant projects. That gives the municipality three to six months to hammer out a compromise with Sand Hill, a prospect that is unlikely given the strong anti-housing bias city residents and officials have taken to this and similar projects. An updated construction timeline has not been provided. 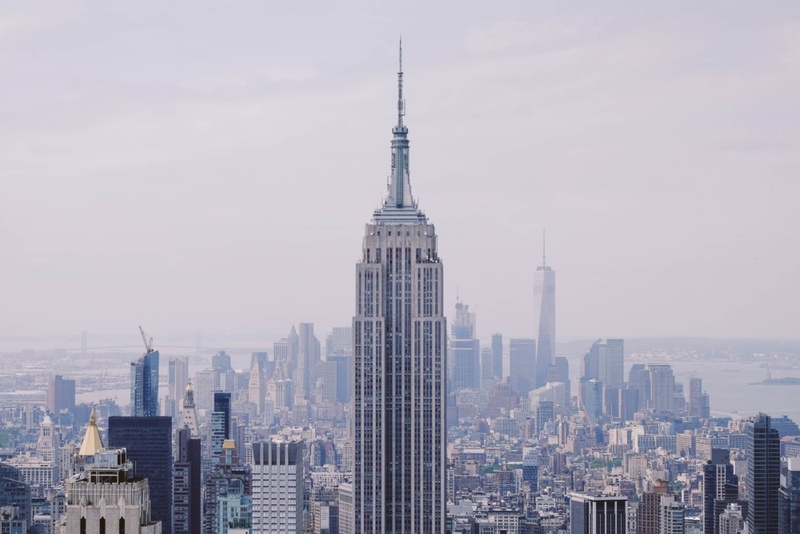 This week the New York City Landmarks Preservation Commission (LPC) is holding a public hearing on changes to its rules of operation. Among other modifications, the new rules would allow the agency to move items off its public hearing calendar, a change the LPC says would alleviate pressure on the almost all-volunteer commissioners who meet weekly to debate and vote on new landmarks, as well as changes to historic properties. Many leading preservation groups, however, believe that channeling more items to agency staffers would deprive New Yorkers of the opportunity to meaningfully weigh in on changes to the historic built environment. Right now, select LPC applicants go through a public hearing, a Tuesday meeting at the LPC’s Manhattan office where architects and owners present their plans to the agency's 11 commissioners and to the public. These meetings let stakeholders weigh in on small items like the window replacement scheme for a private home in Crown Heights, Brooklyn, and on headline-grabbing proposals like the landmark potential of Philip Johnson and John Burgee’s AT&T Building. Discussions on each item can last twenty minutes or one-and-a-half hours, depending on how controversial the item is or if the commissioners debate the owner's request vigorously. Other more minor issues, like small storefront build-outs in a landmarked building or railing replacement on a private home in a historic district, get evaluated by LPC staff and approved behind the scenes. The items in public hearings are seeking a Certificate of Appropriateness, while the items processed by staff are awarded either a Certificate of No Effect or a Permit for Minor Work. The draft of the new rules (PDF) addresses both changes to the public hearing process as well as issues like sidewalk modifications, appropriate materials, and “no style” buildings, to name a few. Together, they cover more nuts-and-bolts preservation issues than can be discussed in a single article, so The Architect’s Newspaper (AN) reached out to preservation leaders to get their take on the key issues the public, especially architects, should watch out for ahead of tomorrow’s hearing on the proposal. Many leading preservation groups are worried that the proposed rules would silence the public’s voice on changes that have a cumulative impact on the city’s historic fabric. Simeon Bankoff, executive director of preservation advocacy group the Historic Districts Council, was concerned about what he sees as a softening of requirements around materials for repairing and replacing historic building components. After six stories on masonry buildings, for example, the new rules would allow owners to use substitute materials like fiberglass in lieu of original stone or terra-cotta when replacing historic building elements. “Rather than lowering the standards—which we felt was being done in many cases in these rules—you want to raise them,” Bankoff said. “People are going to build to whatever standard you give them. If the reward is they don’t have to go through a public hearing, they should be held to the highest standards possible.” Under the new rules, rear yard additions, which can be contentious, would be heard by staff only, provided they met certain requirements. HDC believes that rear-yard addition should go before the public, because neighbors have a right to comment on what is (literally) going on in their backyards. On the plus side, Bankoff said, the proposal includes “nice language” on the collective impact of rooftop and rear yard additions, as well as signage. Andrew Berman, executive director of the Greenwich Village Society for Historic Preservation (GVSHP), a leading downtown preservation group, expressed concern that, under the new public hearing rules, more buildings could wind up like Twin Peaks, an unusually proportioned Greenwich Village co-op that that exemplified the neighborhood’s bohemian spirit. The owner got staff approval last year to repaint the structure and its distinctive brown half-timbering beige and dark grey, a move that Berman believes could have been avoided had the public been given a chance to weigh in on the significance of the original contrasting color scheme. He was blunt about the impact of the changes to the public hearing. “The proposed rules are fundamentally anti-democratic, anti-transparency, and anti–public participation. This is the opposite direction the commission should be moving in.” Landmark West! Executive Director Sean Khorsandi echoed GVSHP’s concerns. “The New York City landmarks commission has been trendsetters, nationwide and globally,” he said. “The commission is in a league of its own; people have been looking to it to set the standards. We see these proposed changes as a little bit of a backtrack.” On the Upper West Side, the neighborhood for which Landmark West! advocates, Khorsandi said the new rules would have a substantial impact on current and future landmarks. The rules would allow alterations to features not mentioned in the designation report, a change that would disproportionately impact earlier designations like The Belnord. The apartment complex’s one-page report doesn’t mention the property’s distinctive vault lights, as the LPC used to require short-and-sweet reports on all items, regardless of their size or importance. This leaves historic features on early designations vulnerable to inappropriate changes or outright removal. To ensure sensitive treatment of protected items, Landmark West! would like to see the agency hire more staff, instead of moving items away from public hearings. Architecture and urbanism advocates at the Municipal Arts Society (MAS) also believe the new rules might unintentionally incentivize removal of these vault lights, among other historic features. Tara Kelly, MAS’s vice president of policy and programs, explained that the group was concerned about the language around “no style” buildings, vague wording that covers structures that are undistinguished or don’t contribute to the look and feel of a historic district. The term originated in the Upper East Side Historic District around three decades ago, but, a “no style” structures of yesteryear might become historically significant years later. Kelly (a former executive director of Friends of the Upper East Side Historic Districts) cited 966 Lexington Avenue, a simple mixed-use building that wasn’t named in the original historic district, but probably would have been included had the district been designated today. “It takes time to appreciate a new style,” Kelly said. “We want to see the commission take a harder look at those buildings, not make exceptions for them.” To help the public understand all the changes afoot, MAS has released a set of interactive maps for each category of permit to help the public understand what landmarks currently exist and how they’ve been modified over time. 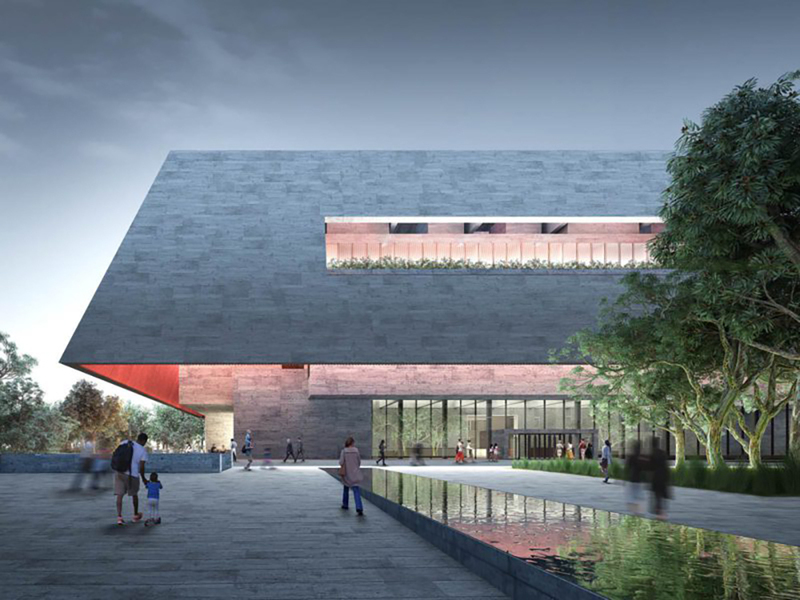 Unlike other preservation groups AN consulted, however, MAS conditionally supports the changes that would move items out of the public hearings. “As long as these rules are strong, robust, and thoughtful and take into consideration the recommendations that we have for the rules, and the staff is well-trained and well-supported in their ability to execute the regulation, we don’t have a problem with the staff doing so,” Kelly said. Although the chatter around the changes to the public hearing is loud (especially on preservation Twitter), the new meeting rules would affect relatively few items. A LPC spokesperson said that each year, the vast majority of the approximately 14,000 permit applications are decided by staff, while fewer than 1,000 items get discussed at the public meetings. Right now, the agency has 36 staff members reviewing permits, and they will welcome three new permit-reviewing staffers in fiscal year 2019, which begins in July. Taken together, the number of permit-reviewing staff has increased 44 percent between fiscal years 2013 and 2019. Even so, the increasing number of permit applications places stress on the commissioners at the public hearing—only LPC Chair Meenakshi Srinivasan is paid for her work. The other ten commissioners take time away from their practices as architects and planners to serve in a volunteer capacity on the commission nearly every week. Of the items that go to public hearing, the LPC contends in its summary of the new rules that agency staff could “approve a variety of work-types that are consistently approved by the Commission utilizing established criteria.” AN spoke with a government insider familiar with the proceedings who confirmed that the changes are intended to save staff time and increase efficiency so LPC staffers can process more applications. Overall, the insider said the intended goal is to make the process easier for homeowners and developers. The rules changes were a long time coming. Beginning in February 2017, the LPC convened multiple meetings with eight leading preservation groups to discuss the agency's ideas. A LPC spokesperson confirmed that representatives from the New York Landmarks Conservancy, MAS, the Brooklyn Heights Association, HDC, Society for the Architecture of the City, Friends of the Upper East Side Historic Districts, Landmarks West!, and GVSHP were shown criteria for specific types of work and asked for input on the criteria. As part of its outreach, agency representatives also met with community boards, members of the public, and other preservation groups, as well as AIA New York (AIANY), Urban Green Council, the NY Bar Association, and REBNY. In addition to those groups, LPC staffers solicited input from window manufactures, expeditors, and preservation architects on the rules. The current draft was released in January of this year. Suzanne Mecs, managing director of AIANY, delivered a statement in support of the rule changes. The organization characterized the public hearings in pursuit of a Certificate of Appropriateness as “a process that can often be expensive, time-consuming, and complicated.” With more items decided on by staff, AIANY believes the public hearing process will improve because, it reasoned, the commission will have more time to focus on “complicated preservation projects with subjective design considerations or innovative technical solutions that do not readily conform to the previously-established criteria of the Commission.” The AIA held a forum on the changes with its members and Srinivasan in early March. For those who want to weigh in on the rules, the meeting begins tomorrow, March 27, at 9:00 a.m. The agenda and more details can be found here. Edward Gunts contributed reporting. Los Angeles–based Omgivning, though only nine years old, is already well known when it comes to adaptively reusing some of L.A.’s most historic structures. The firm’s name—taken from the Swedish word for “ambiance”—was started by Karin Liljegren in 2009 after she spent 15 years specializing in adaptive reuse projects, including the revitalization of Downtown L.A.’s Old Bank District, at Killefer Flammang Architects. 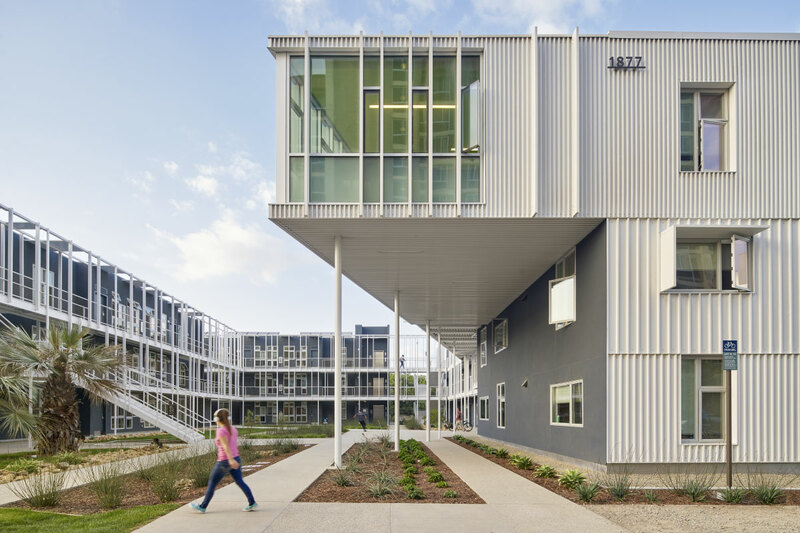 Liljegren’s office grew out of a desire to “help people connect to something” in their built environment, as she explains it, a concept the designers use to push the limits of adaptive reuse. The office has worked on over 250 projects, everything from two-million-square-foot behemoths to tiny coffee shops, and it currently has a slate of impressive designs in the pipeline that will help reshape how Angelenos live and work in their city. Broadway Trade Center Omgivning is currently working on a 1.1-million-square-foot restoration of the Broadway Trade Center in Downtown Los Angeles. The five-story Beaux Arts–style structure—designed in 1908 by Alfred Rosenheim as a department store—has been underutilized since the 1970s. 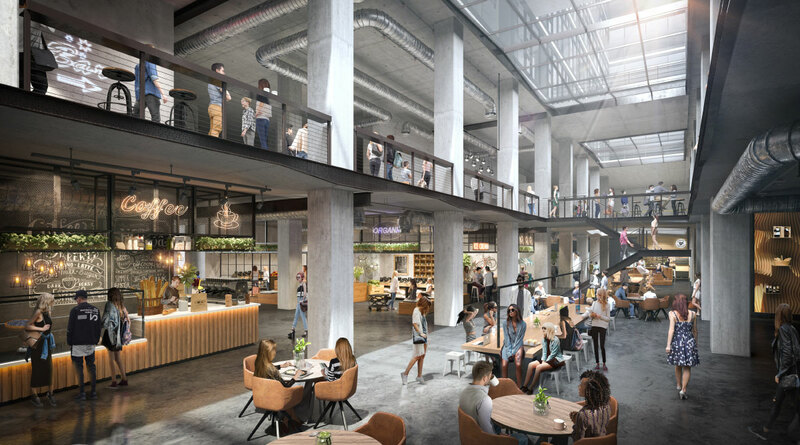 Omgivning is repurposing the building into a mixed-use complex that will contain storefronts and a food hall along the ground with 400,000 square feet of creative office spaces on the levels above. The architects will also add a series of rooftop structures to the complex, housing a private social club, a 100,000-square-foot hotel, and two roof decks. Though the project will contain two separate rooftop pools, designs are being carried out in a somewhat open-ended fashion in anticipation of potential market shifts that could require the complex to be reorganized in the future. Sears Building The office is also working to reconfigure one of the city’s most recognizable landmarks: the Sears, Roebuck & Company Mail Order Building designed by George C. Nimmons, in Boyle Heights. The art deco megastructure contains 1.8 million square feet of interior space and is made up of eight separate structures all contained under one roof. For the project, Omgivning is carving nine light courts into the ten-story building to bring in daylight and accentuate each of the building’s discrete sections. The light courts will create massive indoor atria while also allowing for the restoration of the original facades along each of these exposures. The massive development will act as a “city unto itself,” Liljegren explains, adding that the scale of the project is such that it can support a wide array of uses, like restaurants, 100,000 square feet of retail, 200,000 square feet of creative offices, 1,030 residential units, and a 130,000-square-foot rooftop. Broadway Lofts Omgivning’s recently completed Broadway Lofts project brings 58 live-work units to an adaptively reused six-story historic office building in Downtown L.A. The complex is packed with multilevel lofts that are connected via new light wells, similar to but at a much smaller scale than the light wells planned for the Sears building. 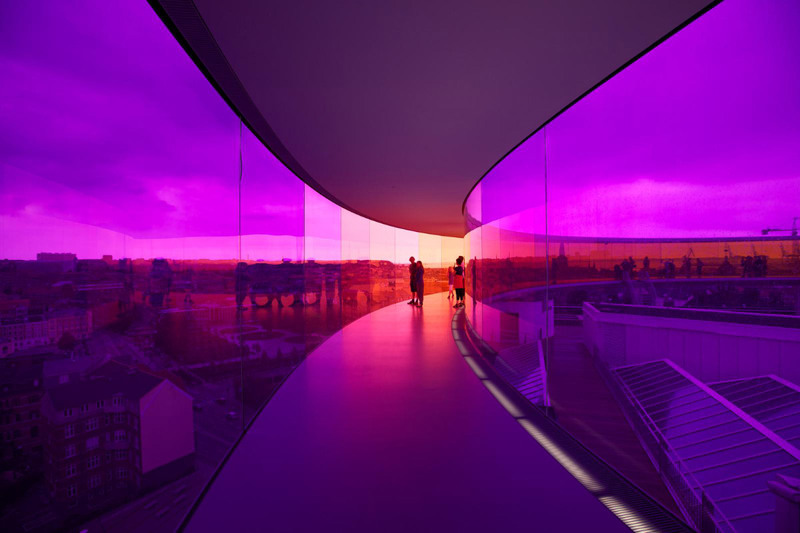 The wells, spanned by new glass bridges and highlighted with floor-to-ceiling window assemblies populated by colored glass, bring interior views and daylight to each of the units. The arrangement allows for each of the 650-square-foot units to receive daylight from two directions. Don Francisco’s Coffee The office also works at the small scale, as evidenced by the tropically inspired designs for the 4,500-square-foot Don Francisco’s Coffee storefront in the historic Spring Arcade Building in Downtown L.A. The white-walled Cuban-themed cafe features wooden midcentury modern furniture, decorative tilework, and gold-topped tables strewn about a long, narrow space. The soaring volume is divided up by concrete structural columns, while a pair of arched doorways frame a separate study room lined with tropical plants. The Humphrey Scottish Rite Masonic Center was built in 1889 as the Congregational Church. In 1912, it was converted into a lodge for the Scottish Rite Valley of Milwaukee, the local branch of the Freemasons. Throughout the years, the Richardsonian Romanesque building underwent a number of renovations and remodels. This year it will see its most drastic change yet. New Jersey-based Kraig Kalashian Architecture & Design and New Orleans–based Metro Studio have produced designs to renovate the original three-story building and add a glassy 14-story tower to its roof, converting it into a hotel. Scottish Rite Valley of Milwaukee recently sold the building to Madison, Wisconsin-based developer Ascendant Holdings, which is now investigating how best to convert the building. The center was once the base for 8,000 local Freemasons, but today that group is under 700, with even fewer active members. It is expected that the project will cost Ascendant roughly $60 million to complete, with a goal of opening in the next two years. The path to redeveloping the building was not a clear one. There is no doubt from any party that the building is a historic landmark. It has been listed on the National Register of Historic Places since 1994, and more recently it has been up for local historic designation. In February 2017, the city’s Historic Preservation Committee approved initial plans for the hotel with a number of caveats. Those included changes to some exterior details in order to leave some of the ornately carved facade exposed. The building is covered in intricately carved figures, and the leaded-glass windows contain Masonic symbols and characters. 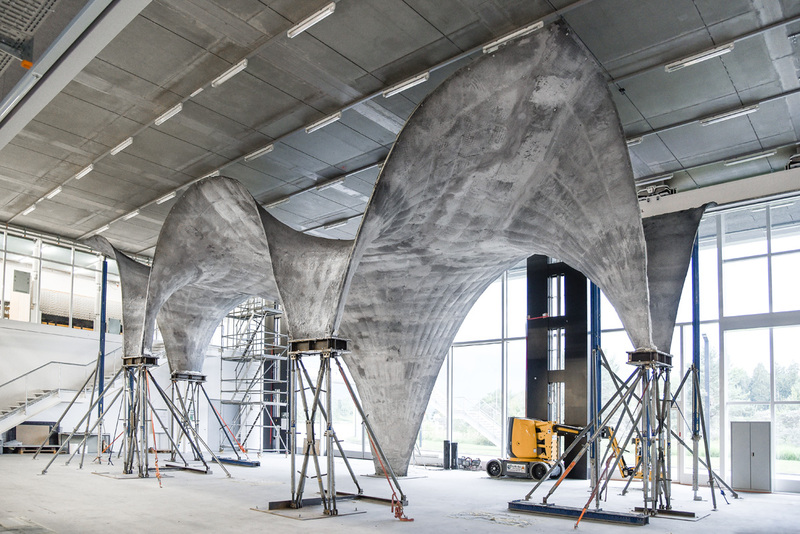 Currently, the new design calls for maintaining as much of the interior detailing as possible, including wood and plaster finishes, and reusing a 350-seat auditorium. 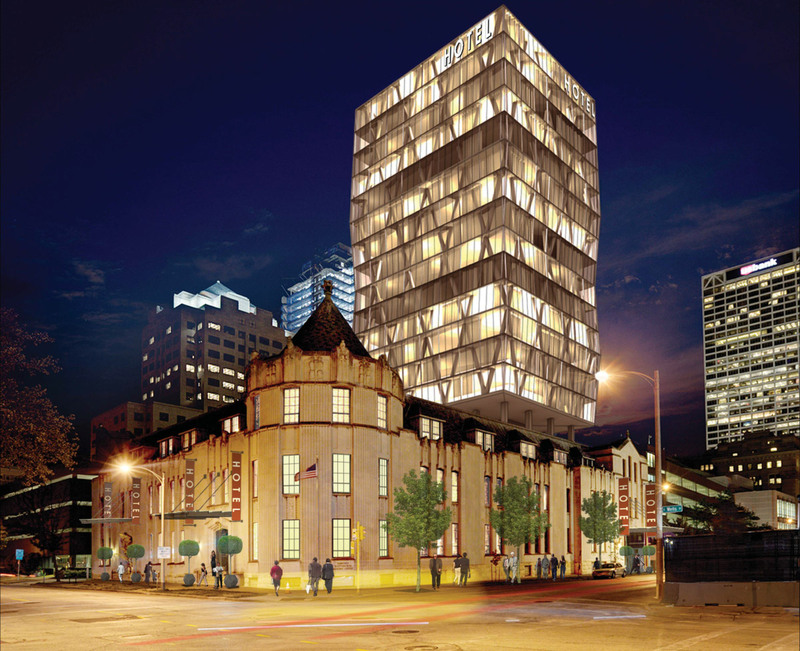 The proposed glass tower will sit on columns, set back from the street front. It will contain 220 rooms, with the original building holding the lobby, meeting spaces, a restaurant, the auditorium, and the possibility of a rooftop bar. When completed, Ascendant has indicated that it wants to continue the process of getting the city’s historic designation, which has been put on hold while the project is developed, and future demolition has been taken off the table. Milwaukee’s downtown is going through a building boom that hasn’t been seen in decades. Just blocks from the proposed hotel, a Pickard Chilton–designed 550-foot-tall office tower was recently completed, and on the other side of the downtown a new NBA arena and entertainment complex are well underway, to name just a few of the major projects happening in the area. Past development booms in Milwaukee have resulted in the loss of innumerable historic structures. It would seem that this latest push upward may be a fair bit kinder, if not just as ambitious.